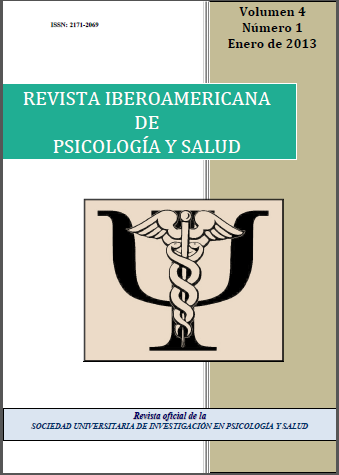 The Revista Iberoamericana de Psicología y Salud, the Official Journal of the Federación Iberoamericana de Asociaciones de Psicología (FIAP), publishes bilbliometric and empirical articles and meta-analytic reviews focused on topics dealing with psychology and health sciences. Papers in Spanish, Portuguese and English may be submitted. The journal is driven to researchers, academics and professionals, specially from the Latin-American community, in Psychology and health sciences (e.g., neuropsychology, general medicine, legal medicine, pediatric, nursing, physiotherapy) with the aim of serving as a bridge between those areas and to transfer evidence based knowledge to academics and professionals at real time. "Asociación Gallega de Psicología y Ley"